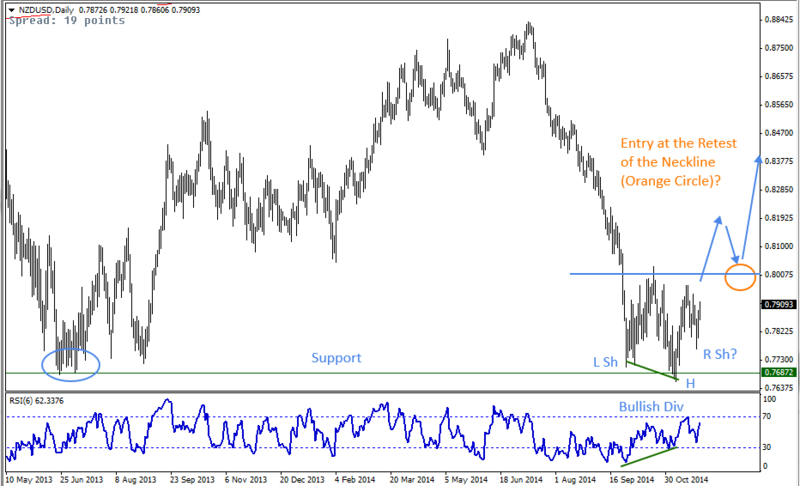 NZDUSD - How Much Lower Will It Go? 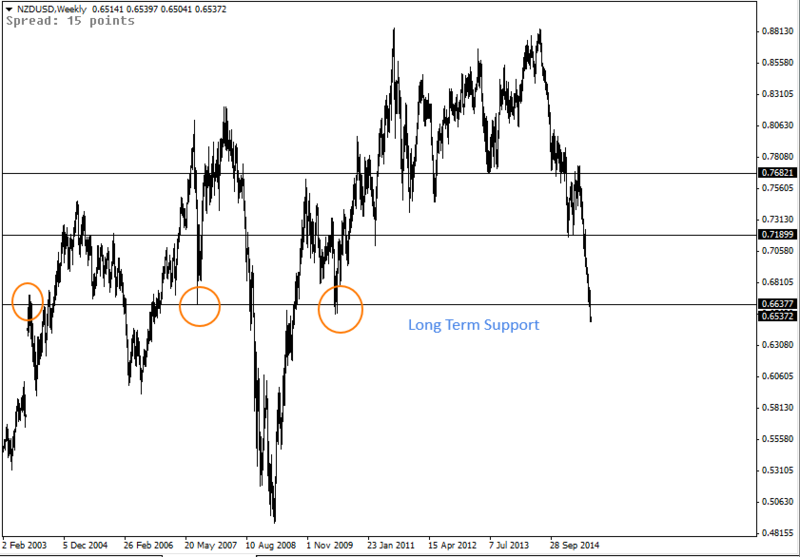 Looking at the chart above, the NZDUSD has been making dramatic lower lows. As the USD continues to strengthen, more majors are moving in one direction, and this one in particular is moving aggressively. 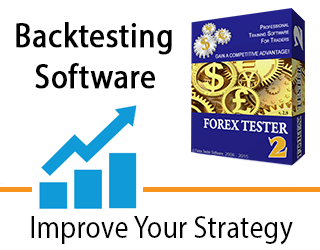 As price is now testing the long...Read More.. In case you have not noticed, Price of the Japanese Yen is now testing a very interesting level. This Major Resistance level was last tested in July 2007 and price has not been back here since. As Yen continues to weaken, will price...Read More..
Here’s a quick update on what I’m looking at. 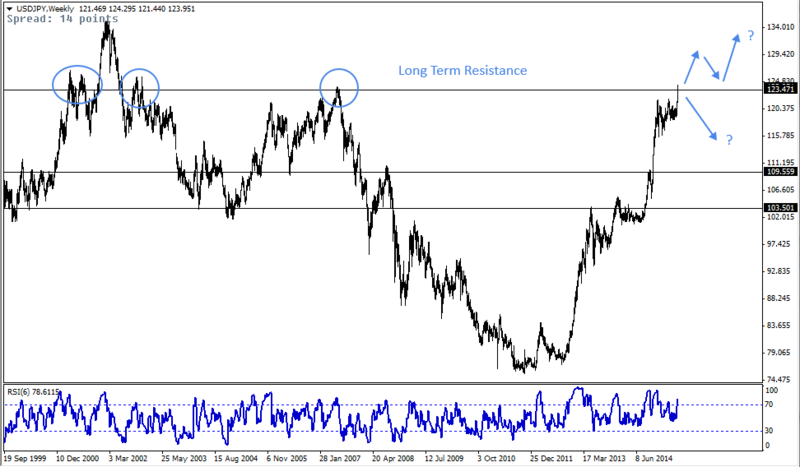 The above is the USDCAD Daily chart and price has recently testing a long term resistance level (~ 1.28). This level was last tested in early part of 2009. However, there was...Read More.. 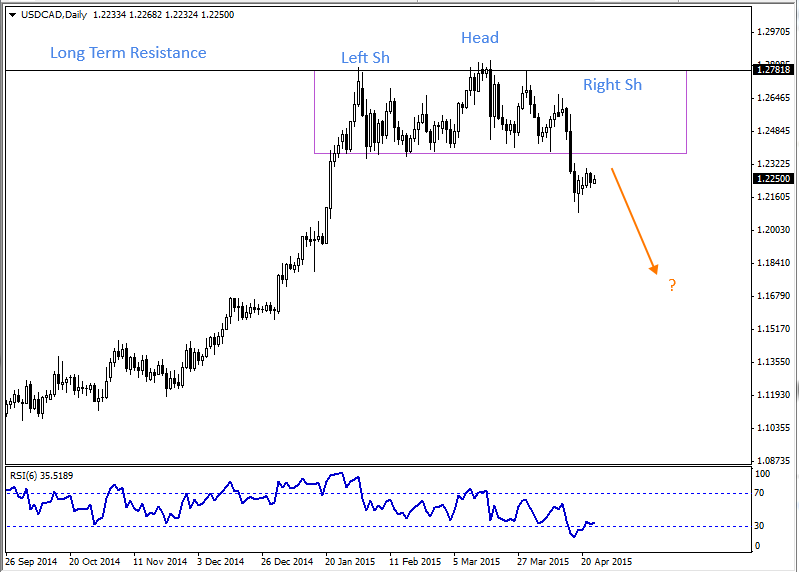 The above is the GBPUSD on a weekly chart. As you can see, price have been falling since July 2014 (see article) and it is still going strong. With the free fall, price...Read More.. 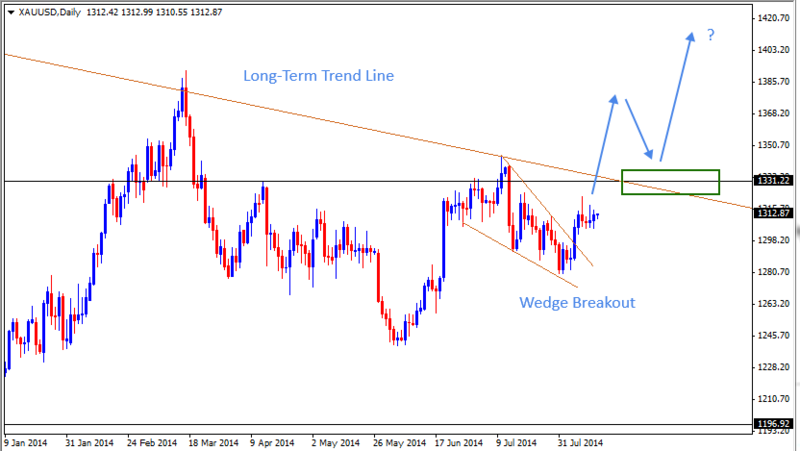 Above is the Gold on a weekly chart. Looking at the big picture, price has not been showing much direction. While price is moving with lower lows and lower highs, price seems to be narrowing into a wedge pattern. In fact,...Read More..
Hope the new year has been treating your well. If not, let’s start by starting afresh today now. 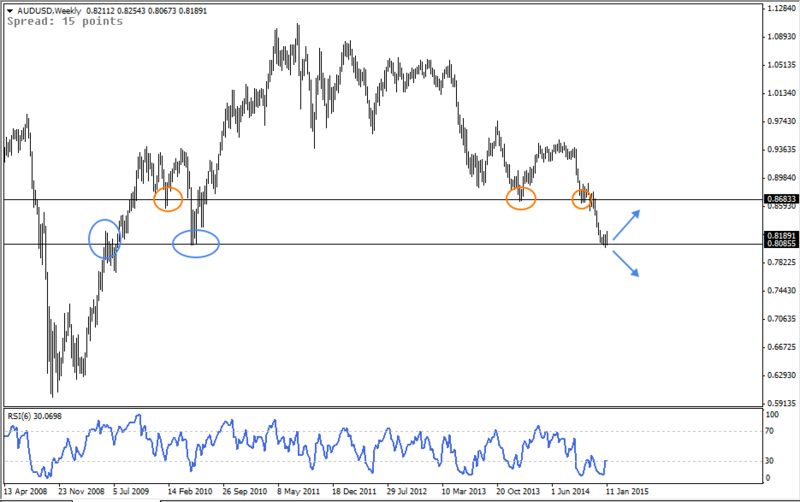 The chart above is the AUDUSD weekly chart. 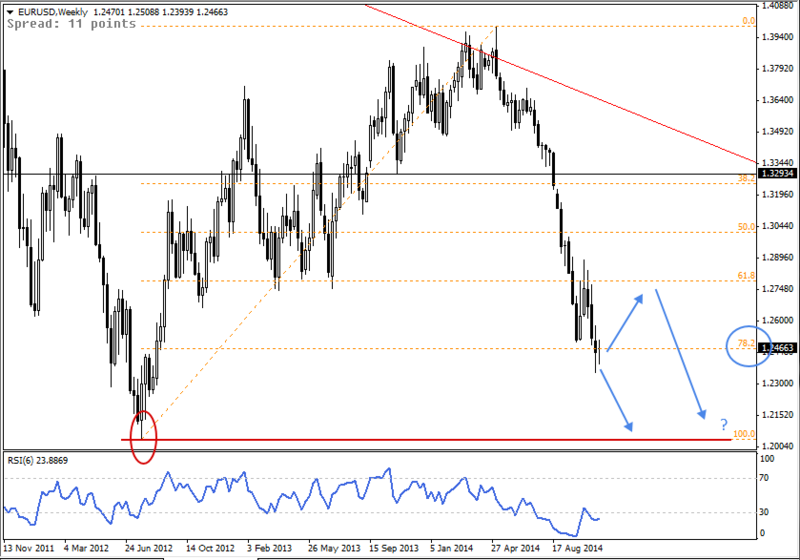 As shown above, the market has been on a...Read More..
NZDUSD - Finding a Long Entry At a Retest? Here’s the latest market update. 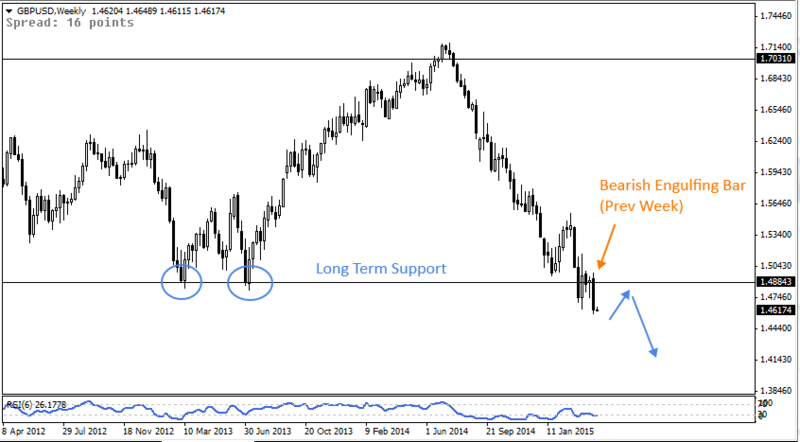 In fact, I’m testing out this format, so please let me know if you prefer a commentary like this or if you prefer the short and simple commentaries that I’ve done in the past –...Read More..
Here’s a quick update on the Euro. Looking at the chart above, price has made a dramatic drop since May 2014 after the break of a wedge pattern (see article). 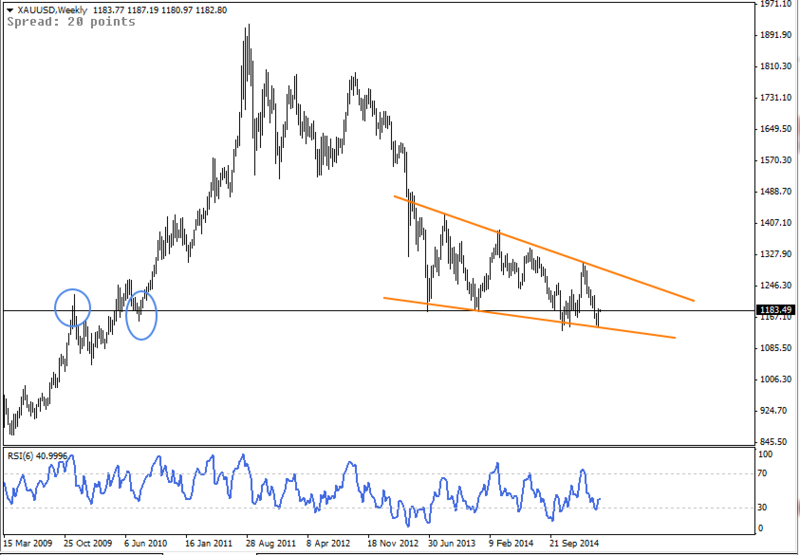 While price looks to continue it’s fall, it also looks...Read More..
Gold - What Does It Mean? Hope you are doing well. This is just a quick update on this precious metal. 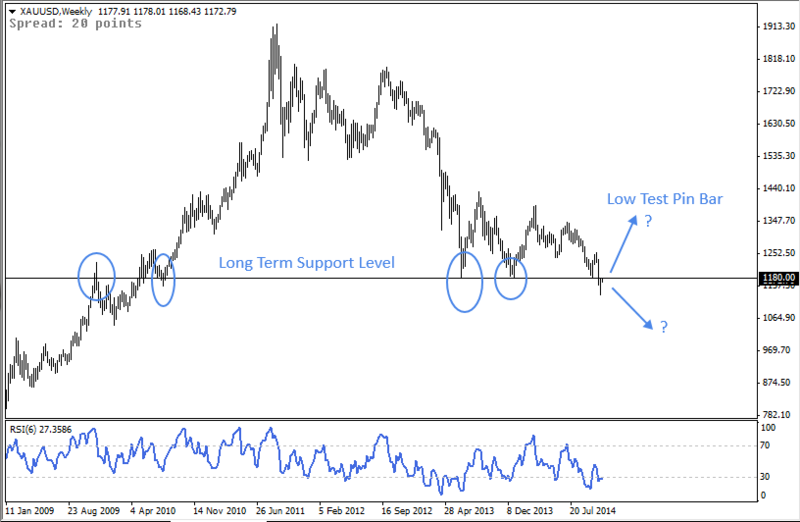 As mentioned on the 31st July (see article), Gold has been consolidating since mid 2013 and it has been testing a long term support...Read More.. The USD index closed around $82.40 this week, quite a surprising move for me but then again, this is a good indication of who is currently taking the lead in the market. 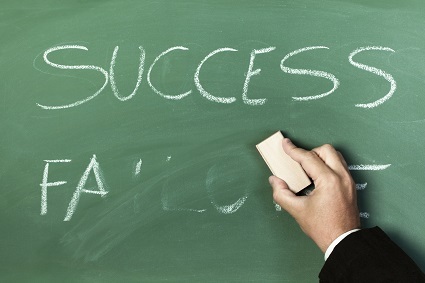 The double high test...Read More.. This week was pretty much a quiet week as the USD index closed around $81.40 for the third week. 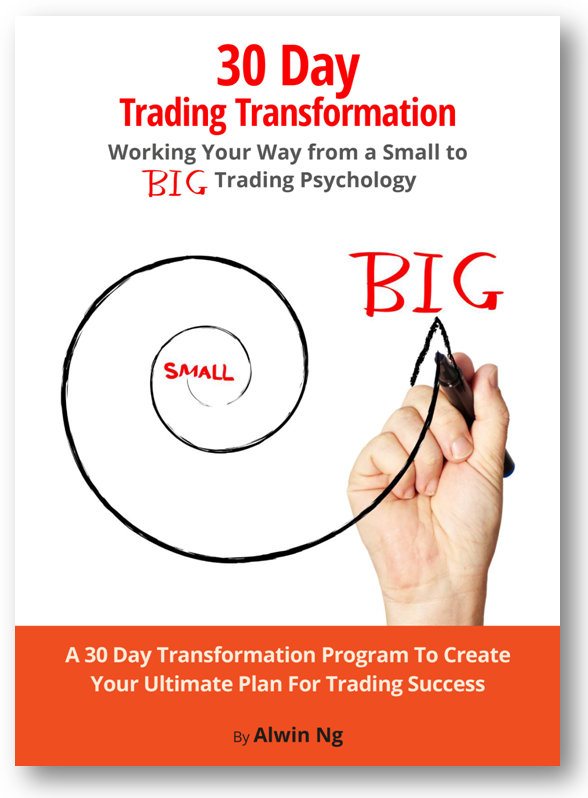 I suspect this is going to be another case of having the calm before the storm....Read More.. Apologies for being quiet, in case you haven’t realised, I’ve been doing some DIY on the website. If you have a chance, please let me know what you think? More importantly, let me know if there are any areas for...Read More.. The USD closed the week around $81.40 again. Looking at price action, the nice high test pin bar gives me comfort that price is about to retrace. 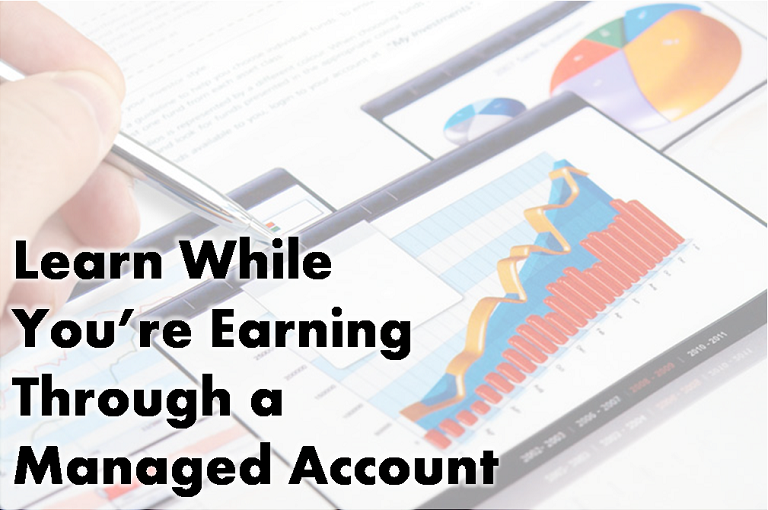 Of course, this can be a pullback or...Read More.. The USD index closed the week around $81.40. More importantly, the high of the week was around $81.70 before it closed lower. Remember the $81.50 resistance that I was looking for? While there is no...Read More..
Gold - What is it doing now? Just a quick update on Gold. After seeing the Engulfing bar on the 15th July (see article), I took a short trade and price became really choppy. Thankfully, it was a...Read More..